I participated in a campaign on behalf of Mom Central Consulting for Boys & Girls Clubs of America in writing about 5 Ways to Protect Your Kids Online for National Internet Safety Month. I received a promotional item as a thank you for participating. Did you know that June is National Internet Safety Month? Ways to protect your kids online is something that has always been near and dear to my heart. As a tween and teen in the 90’s and early 2000’s, I absolutely loved exploring the new fangled technology called the internet and what it had to offer. Unfortunately, back then the internet was largely unprotected, which meant there were lots of shady characters looming around. As a teen, I loved chatting online to local and new friends from all around the world as a sort of new electronic pen pal compared to the letters I had grown used to sending as a younger child. However, there was also a fair share of adults (and sometimes even other kids) looking to prey on children for their own less than stellar objectives. This included sexual solicitation, harassment and sometimes even bullying. I know that I was exposed to more instances of such subjects far more than I could count, but luckily I had a good head on my shoulders to know better than to ever act on anything. Today, while the internet is watched and regulated for kids a bit more, we all also use the internet more and have access to it more often thanks to devices like phones and other gadgets so the threat is still very real. Here are 5 ways to protect your kids online. 1. Have an open dialogue about internet safety issues. We all like to think it won’t happen to our kids, but the threat is very real. Take the time to have an open dialogue with your kids about issues like online predators and harassment and bullying. As online bullying seems to become more and more of an issue, talk with your children about show they would feel if their peers started bullying them online to help dissuade them from joining in with friends that may start rumors. Kids also sometimes don’t realize the risk of posting personal information in profiles like where they go to school, phone numbers and email addresses. 2. Friend them on social networks. No, it doesn’t feel cool to have mom or dad spying on you, but by friending your kids on their social network you can keep track of what they are saying, who they are interacting with, and who their friends are. According to your child’s age and maturity, it may also be a good idea to know their password and let them only approve friendships with your okay. 3. Monitor their internet usage. If you have younger kids, try to keep the computer in a public area where you can closely monitor their internet usage. Have open communication about the types of sites they shouldn’t be visiting, or a list of sites they are permitted to use. There are also many programs out there that restrict websites that can be visited, along with files that can be downloaded or installed. 4. Search for them on Google regularly. I think we all Google ourselves now and then just to see what shows up, but it can also be a good idea to search for your kids as well, including their email address. This way you can see where your child may be posting comments or pictures or make sure their pictures aren’t being used without your authorization if you tend to post a lot of pictures online. Did you know that you can even search for similar images on Google? 5. Limit their access. The internet can be addictive enough for us as adults, but also for our kids with easy access to chatting, games, music and more. Limit how much time your kids can be online and keep an eye on them to make sure they really are using it for school work when they say they need to. Does your younger child really need a smartphone when you want them to just have a phone for emergencies? I love the children’s phones that only allow them to call a couple numbers instead of all the bells and whistles many phones have these days. What’s your experience with these ways to protect your kids online or what are some of the ways you help protect your kids online? 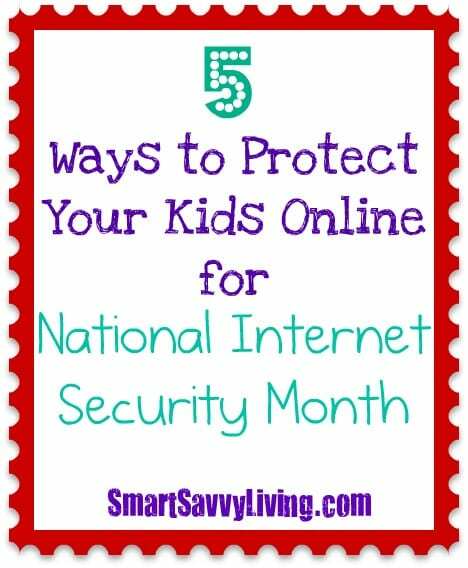 Disclosure: 5 Ways to Protect Your Kids Online for National Internet Safety Month is a sponsored post, but all opinions are my own as internet safety is very important to me. Thanks for great content! It’s so important we are involved with our kids :) We’d love for you to come check out kids email, a safe service for kids!